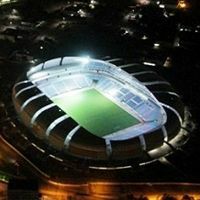 At 10pm on Tuesday all 306 lamps were lit at Arena das Dunas, marking the very first test of the HD/3D-compatible floodlighting system. Each of the lamps located around the inner edge of the roof provides 800kW of energy and together make up for the required 2,000 lux lighting. The stadium is equipped with four power generators to provide continuous service throughout any night-time event. Back-up system assures that light will stay on even in case of power shortage. Upcoming weeks will see the very last touches at the stadium (mostly furnishings and installation works) along with a major clean-up operation after construction works. On Jan 20 president Dilma Rousseff will visit the stadium. Three days later a plaque with names of all workers will be revealed, while the workers themselves will have a party at the stadium. Finally, on January 26 the stadium will open for everyone with two inauguration games. First one will be played in the Brazilian cup (América - Confiança-SE), while the second is a regional Campeonato Potiguar fixture between ABC and Alecrim.